When former chef Adam Smith opened a small cafe in Britain’s industrial north two years ago, serving up dishes with food destined for the scrap heap, he had big aspirations: To fight global food waste. 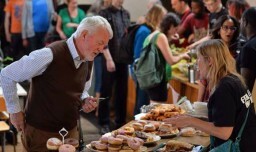 “From day one I set out to feed the world and I intend to do that,” the Yorkshireman ambitiously said, as he charted the growth of his ethical empire, the Real Junk Food Project (RJFP). From its humble roots in a community center in the deprived Armley district of Leeds in northern England, the project now has around 120 affiliated cafes around the world, including in Australia, France, South Korea, the U.S. and, most recently, Nigeria.